DERIVATION: from the Latin borealis for northern. Also called Rudolph's Rorqual, Coal Fish Whale, and Sardine Whale. 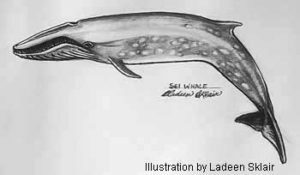 The name of the sei whale is derived from a Norwegian name seje for pollack, a fish that is sighted off the coast of Norway every spring. It is usually pronounced "say," although some use the pronunciation "sigh." The sei is a baleen whale and they are usually divided into three families. The sei belongs to the Balaenopteridae, or rorqual whales, that have numerous ventral grooves and a dorsal fin. Balaenopteridae is from a Danish word meaning "tubed" or "pleated" whale. The other rorquals are: blue, fin, Bryde's and minke. Seis are somewhat smaller than the fin whale which, in turn, is smaller than the blue whale. It reaches a maximum length of 68 feet; most adults are in the 50-60 foot range. In this species, the females are larger than the males. This slim, graceful animal can weight up to 40 tons. Males and females become sexually mature at six to twelve years of age. The gestation period is between 10.5 months and 12 months, and the calves are weaned when they are five to nine months old. Females give birth, usually in the winter, at two to three year intervals. It is estimated that individual whales have lived up to 74 years. 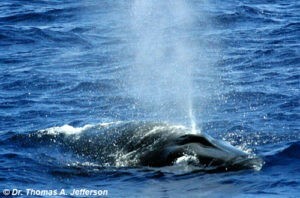 From a dorsal view, the snout is less rounded than the blue whale, and less acutely pointed than that of the fin whale. Its body is dark gray on its back and sides, often with ovoid gray-white scars. They may be caused by the small cookie cutter sharks Isistius brasilienis that inhabit the warmer waters that are part of the sei's annual migration. Its flippers and flukes are not white underneath. The flippers are relatively small and pointed on the tips; the flukes are small for its body size. The sei has about 300 to 410 baleen plates on each side of its mouth that are uniformly ash-black with fine white fringes that have been compared to a sheep's fleece. A few sei whales have several half-white plates near the front of their mouths and therefore may be mistaken for fin whales. Its baleen is smaller than the other rorqual whales, because it feeds primarily on small organisms and requires a much finer straining mechanism to capture them. They have, however, been known to feed on small schools of fish and even squid. It has between 30 and 60 ventral pleats in its throat. It feeds by skimming and swallowing usually in surface waters. Food is caught on the fine fringe of the baleen. They may also gulp mouthfuls of water containing food. When feeding, sei whales do not swim on their side as other rorquals do. As they feed horizontally near the surface, they may exhibit a highly regular blowing and diving pattern over long periods with blows at 20 to 30 second intervals followed by a dive of 15 minutes or longer. The usually travel in groups of two to ten, although larger groups may congregate in feeding areas. Its blow is an inverted cone, similar to the fin whale's, but lower and less dense. It is a pelagic species and normally seen far from shore. They are distributed worldwide, but in some areas their presence is sporadic and unpredictable. It has a habit of suddenly appearing in an area for days or even months and then disappearing completely for years. A study by whale expert Phil Clapham in the Gulf of Maine revealed that until 1986, only one sei had been present in the Massachusetts Bay Region for more than ten years. In the summer of 1986, more than 50 sei whales appeared in the area and they remained for several weeks. They were apparently attracted by the high summer concentration of the copepod Calanus finmarchicus. The whales disappeared in the early autumn just as suddenly as they had appeared. Only two were sighted in the following year and none thereafter. This behavior has been documented elsewhere in areas as far apart as Norway, California and Japan. Presumably this activity is caused by opportunistic feeding of abundant prey, but it is unknown as to why other whales do not demonstrate similar behavior. The sei is not known as a deep diver and submerges for generally 5-10 minutes. When it begins a dive, the whale usually submerges by sinking quietly below the surface only remaining a few meters deep. A series of swirls or tracks are left on the water's surface as they move their flukes, rarely raising them as they dive. They usually surface at a shallower angle than Bryde's or fin whales, and the head rarely emerges at a steep angle unless the whale is being hunted. The sei is one of the fastest whales and reported to have bursts of speed of over 20 knots. Records indicate that they can move over great distances at relatively high speeds. A marker was inserted in a sei in the Antarctic and the whale was killed ten days later. During the time between marking and recovery, the whale had covered more than 2200 miles. To do this, it would have had to travel at an average sustained speed of almost ten knots. They are found throughout the world in separate populations. They have been sighted in the Pacific, the North Atlantic, the Southern Ocean, and off South Africa, Australia and Brazil. The sei has been heavily exploited in all areas where it was known to be abundant. The status of the sei stocks is poorly known, except that some are now below pre-exploitation numbers. Its biology and ecology has been poorly studied and information on its behavior is scarce. There was a pronounced increase in the killing of sei whales during the 1950s and '60s because of the decline of blue and fin whales. It is an endangered species but not among the most endangered of whales. Its versatile feeding habits aid in their recovery. One estimate is that from an original population of 200,000, sei whales have been reduced to 75,000.